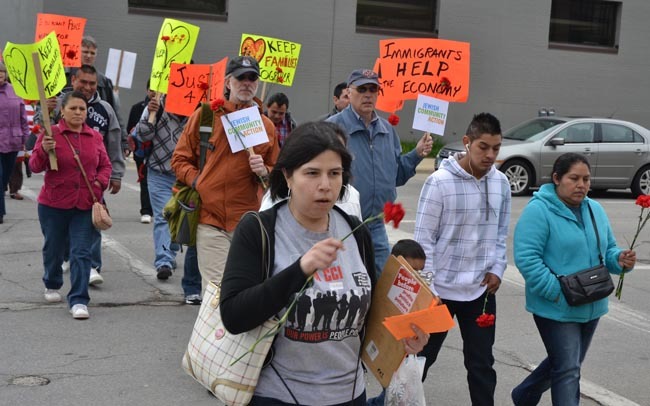 CEDAR RAPIDS, Iowa (CNS) — Carrying red flowers representing the 389 workers arrested during a 2008 raid, hundreds of people participated in a Walk for Justice and interfaith prayer service to commemorate the fifth anniversary of the immigration raid on the Agriprocessors Plant in Postville. On a day full of speeches by spiritual leaders, political figures, advocates for immigrants, and immigrants themselves, a student’s words stood out. Pedro Arturo Lopez’s address earned a standing ovation from the crowd that packed Immaculate Conception Church in Cedar Rapids May 10. The teenager, who was to graduate from Postville High School May 19, felt the fear and uncertainty of the May 12, 2008, raid as much as anyone when he was separated from his mother, who was later deported, while he stayed in Iowa. “When I walk across the stage for my graduation next week, I want to feel a part of my class, my community, and, in my heart, what I feel to be my nation, the United States of America, not just another wasted potential,” Lopez said. Lopez used the day’s events, like many other speakers, to bring attention to the need for reform. The walk began about noon in front of the federal courthouse in Cedar Rapids and ended at the church. Pastor David Vasquez, campus minister at Luther College in Decorah, and Father Greg Bahl, pastor of St. Bridget’s Parish in Postville, stood on a grass lawn above the marchers, as they waived signs and banners. Before setting out for the mile long trek, Vasquez, who was among a coalition of Protestant, Catholic, and Jewish leaders that helped the immigrants in the aftermath of the largest workplace immigration raid in the nation’s history, gave a few last-minute instructions in English and Spanish before calling for a moment of silence. During the opening blessing to the prayer service, recently retired Dubuque Archbishop Jerome G. Hanus of Dubuque, who visited Postville shortly after the raid in 2008, alluded to how the event tore apart families and devastated the community of about 2,000 residents. “We seek to reconcile with the United States Department of Justice and to join with all institutions working to reframe national policies affecting the lives of immigrants,” said the archbishop. The Postville raid garnered international headlines in 2008. Agriprocessors, the largest kosher slaughterhouse and meat packing facility in the country at the time, had been operating since 1987 under the ownership of Aaron Rubashkin and his family. In the years leading up to the raid, the plant had been breaking health, safety and labor laws, a fact highlighted in the documentary “AbUSed,” by filmmaker Luis Argueta. In 2004, People for the Ethical Treatment of Animals released videos taken undercover, which show horrible conditions for employees and animals. In 2006, the business was fined $600,000 for pollution caused by releasing untreated slaughterhouse wastewater into the Postville sewer system. Dozens of Immigration and Customs Enforcement agents executed a criminal search warrant May 12, 2008, and collected evidence showing violations of child and other labor laws, safety rules infractions, sexual abuse of female workers, and document fraud. They took the arrested immigrants for mass processing at the National Cattle Congress in Waterloo. A majority were charged with identity theft but pleaded guilty to lesser charges as part of a plea bargain. Most did not understand the charges against them and were not, in many cases, given adequate access to legal counsel. Many served about five months in prison and were then deported to their home countries of Guatemala, Mexico, Israel and Ukraine. Many female workers were permitted to stay in Iowa to care for children, but were required to wear ankle monitoring bracelets and could not work for up to two years while waiting for a long judicial process to unfold. Fermin Loyes, 32, was one of the hundreds separated from his daughters and wife. After being granted a U visa to re-enter the country, he was re-united with his family and participated in the events May 10. “A reform would lead to the opportunity for many families to be together,” said Loyes in Spanish. Sister Mary McCauley, pastoral administrator at St. Bridget’s Parish during the Postville raid, was among those on the frontline in the immediate aftermath. The parish rectory became a hub of activity during that time, but, she said, the work is not done. 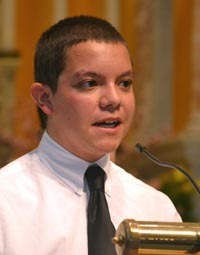 “This anniversary gives us an opportunity to reach out to our government, to our employers who through greed and unscrupulous behavior took advantage of our undocumented workers, to our neighbors who fear the stranger, to our legislators who have been slow to re-write our broken and inhumane laws and to call for reconciliation and reform,” said Sister McCauley, a Sister of Charity of the Blessed Virgin Mary. Postville City Councilwoman Dawn Hernandez, whose mother-in-law was deported after the raid, said the town is still not back to normal, but it’s getting there. The plant was re-opened after being purchased by a new owner, Agri Star Meat & Poultry. Some workers from the time of the raid have returned, but many workers are refugees from Somalia, according to Hernandez. Russo is a staff writer at The Witness, newspaper of the Archdiocese of Dubuque, Iowa.